Welcome to Nacogdoches, proud hometown of USA Futbol (soccer) team captain Clint Dempsey. Lately, we've earned the title of Garden Capital of Texas. Known also as the First Town in Texas - or The Oldest Town in Texas - it is in Nacogdoches that you walk in the footprints of history. Texas starts here. For centuries the people who have called these lush forests home cultivated the land and tended gardens that nourished the body and spirit. Our streets are lined with landmarks sacred to Texas history. Caretakers of these historic places diligently preserve the original atmosphere with eye-catching landscaping and native plants. The people of Nacogdoches have a long-standing tradition of thoughtfully cultivating the splendor of nature, making life more pleasant for residents and visitors alike. We invite you to discover the charm of Nacogdoches. You may just decide to stay and become a part of the Garden Capital of Texas. The Nacogdoches County Chamber, and the Nacogdoches Convention and Visitors Bureau (CVB) invite you to experience the spirit of Nacogdoches. Visit the Chamber's website - www.nacogdoches.org or call 936-560-5533. 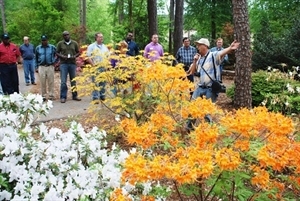 Also visit the CVB website www.visitnacogdoches.org or call 936/564-7351. The toll free number is 888-OLDEST-TOWN (888-653-3788). Stephen F. Austin State University (Enrollment: 12,800). The Lamp-Lite Community Theatre, one of the largest in East Texas, has been serving the community for more than 35 years. A troupe of over 100 actors performs a variety of shows including comedies, drama, children’s theatre, holiday specials, and an annual musical. As a volunteer based organization they are always looking for talent on stage and behind the scenes. Acting workshops are held regularly. The playhouse comfortably seats 250 and offers year-round entertainment. In 1971, the Lamp-Lite was formed with Sarah McMullen as founder and director. Its first home was the Christ Episcopal Church parish hall. The Lamp-Lite troupe joined, in 1976, with other local artists to form the City Spirit Arts Center which utilized space in the Phelan Warehouse in downtown Nacogdoches. For a year the troupe performed dinner theater productions and went on the road to perform in various East Texas cities. Through grants, volunteers and friends, the theater used today was created. Materials were taken from the old Phelan Warehouse and moved to the current location, on loop 224 at Old Tyler Road, where the new theater was constructed. On May 19, 1979, the Lamp-Lite Theatre opened at its new location with "The Last of the Red Hot Lovers," by Neil Simon. The College of Fine Arts' University Series brings 5 national or international touring productions to SFA each academic year. These usually include orchestral, chamber music, theatrical, dance and / or vocal performances. Prior to each of the performances, the college hosts an informance which includes a reception honoring the event's corporate sponsor and a brief informative talk about the production. The Children's Performing Arts Series presents five children's shows throughout the year. These are offered during the school day and are attended primarily by area school groups, but many parents and grandparents bring their young family members too. - 1 free outdoor "Concert in the Park"
Note: The music concerts are held either in W.M. Turner Auditorium, Cole Concert Hall or the Music Recital Hall. The Mainstage Series consists of four full-length dramas; two are offered in the fall, and two are offered in the spring. These have five performances each. Every other year, the series includes a musical, and on alternate years, the series usually includes a Shakespearean play. On even-numbered years, one of the spring productions is a Playreading Festival of New American plays. Our playwright-in-residence, Jack Heifner, selects three new plays and invites the playwrights to Nacogdoches where audiences can see premiere performances of the newly written plays and meet the playwrights. The festival is held in the Downstage Theater. Two to three public student-directed plays are offered each semester in the Downstage Theater. Each summer, the school presents two to three plays in repertory during June and July. The school hosts high school one-act play competitions and a high school workshop in the summer. The performances are open to the public. The Original Cast, the school's cabaret-improvisational troupe, presents an annual musical revue and performs for civic organizations and other sponsors throughout the year. The School of Art presents 8 exhibitions a year, Texas National, an annual national competition now in its 12th year. Through all of the exhibitions, the school strives to present a variety of works and artists, including national as well as local artists. The opening of each exhibition includes a reception and a gallery talk, usually by the artist or curator. The school also presents numerous BFA and MFA shows at the end of each semester. All exhibitions are held either in Griffith Gallery or one of the two galleries located in the Art Building. The university also owns The Art Center in the Old Opera House in downtown Nacogdoches, but it is currently undergoing a major renovation. All exhibitions and receptions are free. The School of Art sponsors a short art tour each semester, usually to the Dallas-Fort Worth or Houston area. These are one-day bus excursions led by a member of the art faculty. The school also offers a one-week spring tour which is usually to a foreign country. Last year, a group went to Mexico City, and this year, they will be traveling to Amsterdam. Each of the schools offers various fund-raising events for special programs. These often include dinner and entertainment by faculty, alumni or guest artists. Some, such as the School of Music's Extravaganza, are annual events. The recent Pineywoods Home Companion, however, was a one-time event to raise funds for Music Preparatory scholarships. The School of Art also offers various art sales throughout the year. The works may be by undergraduate or graduate students, alumni or faculty. This local bus service includes two fixed-routes and curb-to-curb service. Public bus transportation operates 5 a.m. to 7 p.m. Monday through Friday, excluding holidays.www.btd.org/Nacogdoches.htm. 800/231-2222 , 4010 South St. Operates taxi service in Nacogdoches seven days a week, 24 hours a day. Health care services in Nacogdoches involve a continuum of care, from home-based and community-based services, housing for the elderly, assisted living, personal care to skilled nursing care facilities. Note: Both of the above hospitals are fully licensed and accredited and are within 30 minutes of any part of Nacogdoches County. Countywide ambulance service and life-flight helicopter service is available. Nacogdoches Treatment Center’s Alzheimer’s Day Activity Program –The program provides a safe, secured, and stimulating environment for individuals who have Alzheimer’s or some other form of dementia. Activities are designed to promote memory function, self-esteem, and social interaction. The program is four hours a day, five days a week. Transportation is provided, but space is limited. For the caregiver, this program also provides much needed respite. A monthly support group is available for anyone who would like to attend. The Texas State Board of Pharmacy data for September 2010 shows there are 19 licensed pharmacies in Nacogdoches. http://www.tsbp.state.tx.us/index.htm. Health Practitioners - According to the Texas Department of State Health Services September 2010 report, there were 64 direct patient care and primary care physicians who practice in Nacogdoches. The ratio of total persons to each physician in the area was 1,037 residents per each physician. This compares to a statewide ratio of 1,448 persons for each physician in Texas. Another way of reporting these figures is by showing the number of physicians as a ratio per 100,000 residents. In this study area, the ratio in direct patient care was 96.4 as compared to the statewide ratio of 69.1 in direct patient care physicians per 100,000 population as of 2010. The ratio of physicians in primary care was 1,032 compared to a statewide ratio of 1,468.0 physicians in primary care per 100,000 persons in the population statewide. http://www.dshs.state.tx.us http://www.texasshcc.org. Nacogdoches has 576 registered nurses (RN), representing a ratio of 112 persons for each RN. The statewide ratio was 144 persons for each RN. For the same time period, the ratio of RNs per 100,000 population was 895.8 compared to 695.6 per 100,000 statewide. There are 291 licensed vocational nurses (LVN) in Nacogdoches, representing a ratio of 221 persons per each LVN. This compared to 366.2 persons per each LVN statewide. The ratio of LVNs per 100,000 population was 452 compared to 273.1 per 100,000 population statewide. The Texas Department of State Health Services information for September 2010 also reports that there were 23 dentists in the study area, with a ratio of 2,796 persons for each dentist in the area. The ratio of dentists per 100,000 residents was 35.8 By comparison, there was a statewide ratio of 44.5 dentists per 100,000 residents, with a total of 11,301 dentists statewide. In September 2010, there were 203 licensed Emergency Medical Technicians, or EMTs, in Nacogdoches, a ratio of 317 licensed EMTs per 100,000 residents. The statewide ratio was 222.2 EMTs per 100,000 residents, with a total of 56,381 EMTs statewide. The report noted 48 pharmacists in Nacogdoches, which is a ratio of 1,340 persons for each pharmacist. Texas has 20,428 pharmacists statewide, or a ratio of 1,242 persons for each pharmacist in the area. The ratio of pharmacists per 100,000 residents was 74.7 compared to 80.5 per 100,000 residents statewide. Nacogdoches has 10 occupational therapists; a ratio of 6,430 persons for each occupational therapist. The statewide ratio was 3,935 persons for each occupational therapist, with a total of 6,448 occupational therapists statewide. The ratio of occupational therapists per 100,000 residents was 15.6 compared to 25.4 statewide. Individual/Family, Emergency & Other Relief Svcs., Vocational Rehab. Svcs. Nacogdoches Memorial Hospital is striving to become a “hospital without walls” — reaching out to citizens and community organizations to make Nacogdoches a healthier community. The hospital debuted a new 64-slice Toshiba CT scanner early in 2011, and will usher in 2012 by more than doubling the size of the Breast Care Center. It will launch a $40 million construction project for a new surgery center and labor and delivery unit, projected to be complete in 2013, when Memorial Hospital will celebrate its 85th anniversary. Memorial Hospital founded the Healthy Nacogdoches Coalition to promote physical activity, healthy nutrition, tobacco cessation and prevention of obesity, diabetes and cardiovascular disease. This organization helped the city secure Gold Recognition as a Heart and Stroke Healthy Community, making Nacogdoches one of only five cities in the state to reach the goal. Early detection and quick response times are vital when a person suffers a stroke or a heart attack. Memorial Hospital’s dedication to the health of the Nacogdoches community was echoed in the investment of time, resources and energy necessary to become the first and only Joint Commission Certified Stroke Center in Deep East Texas. Memorial Hospital is actively pursuing a similar accreditation for the Chest Pain Center. The future of medicine and the key to speedy patient recovery lies in skilled physicians offering precision surgery using breakthrough equipment. Memorial Hospital is the only hospital in Nacogdoches to offer the da Vinci® robotic surgery system for major surgeries such as prostatectomy and hysterectomy. Memorial Hospital is also the only hospital in East Texas offering balloon sinuplasty — a cutting-edge, minimally-invasive sinus surgery. At Memorial Hospital, patients have been the focus for more than 80 years. First known as City Memorial, the hospital opened in 1928 with 28 beds. Now with 216 beds, Memorial has evolved into a sophisticated regional referral center, designated as the only Level III Trauma Center in this region by the Texas Department of Health. Patients trust Memorial Hospital for high quality, innovative health care. With the staff addition of Dr. Sheila Hill and Dr. Kim Schaus, both board certified Ob/Gyns, more choices are now available to Nacogdoches women. “Choose from a full slate of Ob/Gyns, certified nurse midwives, pediatricians and family practice specialists to bring top level care to your family. The birthing center at Memorial is one of the most family-centered, comfortable and attractive L&D programs in the East Texas area,” Hayward said. Space-age technology- “Patient comfort and safety have been our focus for decades, as we’ve engineered a Medical Imaging Department unrivaled in Deep East Texas. Our most recent addition is PET/CT technology, which can determine, in a single scan, whether cancer exists and its exact location. PET/CT technology can also help with diagnosing and monitoring Alzheimer’s Disease,” stated Hayward. Surgery and the Heart Program - With laser and laparoscopy capabilities and a separate gastrointestinal laboratory, Memorial provides all levels of surgery from the most minor tonsillectomy to major open-heart surgery. Memorial is one of this area’s “grandfathers” in the open-heart surgery field, with almost 20 years of outstanding outcomes. “We believe in the ‘gold standard’ of heart care - cardiac catheterization - as the best tool to accurately diagnose - and immediately treat - heart disease,” Hayward said. For a complete list of services and information about Nacogdoches Memorial Hospital’s physicians, visit www.nacmem.org. Quality patient care; nationally-recognized healthcare practices; positive clinical outcomes and advanced medical technology are just a few of the key attributes of Nacogdoches Medical Center. Quality is the cornerstone of everything at Medical Center and the hospital’s track record demonstrates the standard of care delivered in Nacogdoches. For more than 36 years, Medical Center’s commitment to quality has set the pace for outstanding innovation in patient care. Medical Center was the first East Texas provider of Brain Lab technology — a system that offers leading-edge precision in neurosurgery and sinus surgery designed for better results and improved outcomes. The sleep lab offers diagnosis and treatment of an array of sleep disorders. Medical Center also completed recent renovations and the installation of technologically advanced equipment in the hospital’s cardiac catheterization lab. Medical Center’s Loma Laird Imaging and Cancer Center features some of the latest digital imaging equipment, providing higher quality information while offering shorter and less invasive exams. Medical Center also provides targeted IMRT radiation therapy treatments designed to precisely target cancer cells without harming surrounding tissue. The Surgery Center of Nacogdoches was founded more than 11 years ago as the first multi-specialty surgery center in Nacogdoches. Today, 19 talented physicians partner with Nacogdoches Medical Center to provide convenient, easily-accessible services. Medical Center’s dedicated Women’s Center offers quality services at every stage of life - from prenatal care and basic infant care to parenting and digital mammography. Third Tuesday Testing offers a variety of free to low cost testing to identify potential health concerns. Community support groups are also offered for breast cancer survivors and diabetes patients. Jan 36.0 F° 47.0 F° 58.0 F° 4.1 "
Feb 39.0 F° 50.5 F° 62.0 F° 4.6 "
Mar 45.0 F° 57.0 F° 69.0 F° 4.2 "
Apr 53.0 F° 65.0 F° 77.0 F° 3.7 "
May 63.0 F° 73.5 F° 84.0 F° 4.4 "
Jun 70.0 F° 80.0 F° 90.0 F° 4.4 "
Jul 72.0 F° 82.5 F° 93.0 F° 3.0 "
Aug 72.0 F° 83.5 F° 95.0 F° 3.3 "
Sep 65.0 F° 77.0 F° 89.0 F° 3.6 "
Oct 54.0 F° 66.5 F° 79.0 F° 4.7 "
Nov 45.0 F° 57.0 F° 69.0 F° 4.6 "
Dec 37.0 F° 48.5 F° 60.0 F° 4.8 "
Nacogdoches, The Texas Forest Country and East Texas enjoy mild winters and warm spring, summer and fall. Rainfall is abundant, helping the gardener and the forester. Snow shovels not needed - a trace is typical, and a significant snow fall (3 inches or so) sends residents scurrying to take pictures before it melts. The Nacogdoches housing market offers affordability and quality in a beautiful setting. Local builders are meeting the needs of senior adults by creating subdivisions and apartment communities that cater to the specific needs of this age group. A variety of housing choices are available, including patio homes, duplexes, condominiums, apartments, and assisted care facilities. Excellent resources for real estate inquiries are available. These include the Nacogdoches County Board of Realtors, www.nacogdochesrealtors.com , the Piney Woods Apartment Association, www.pwaa.net , and the membership listings of the Nacogdoches County Chamber, www.nacogdoches.org . Raguet Reserve is a recent subdivision with 70-plus lots selling for $40,000 and up. These lots are about 125 by 150 feet. Summer Hill and Ashbury Court feature zero-lot garden homes, two-car garages, all underground city utilities, privacy fences, available yard maintenance and deed-restricted design with a private homeowners association. www.austinhollow.com/summerhill . According to the Real Estate Center (www.recenter.tamu.edu), residents and newcomers purchased 402 homes in Nacogdoches in 2010, up from 362 homes purchased in 2009. Total value of those sales was $52 million, with an average sales price of $131,600 and a median price of $127,800. About 50 percent of the homes sold were in the range of $90,000 to $180,000. A total of 260 homes were listed with a 7.7 month inventory. According to local Realtor Gay Roach, her figures showed a total value of $55 million sales in 2010, with an average price of $138,282 and median price of $132,500. She reported 140 homes listed for sale in the city in October, 2011 and 277 countywide. www.Realtor.com listed 238 homes for the same time period with prices ranging from $40,000 to $995,000. Over half of the homes listed were between $100,000 to $250,000. For renters, several dozen apartment complexes are available, with rents averaging from $400 to $800 per month, depending on age and quality of the unit. Many rental homes are also available, with rents averaging $600 to $1500 per month. The city has five mobile home parks. Several other apartment communities are available that are popular with above-college-age adults, such as Pruitt Park, University Hill and Dogwood Village. There are many other apartment communities in the city that include a mixture of tenants, ranging from university students to seniors. These include Arbor Pines, Banita Creek, The Californian, Cambridge Court, The Colony, Curry, Deer Cross, Deer Wood, Chevy Chase, Commonwealth, Ellington Court, The Grove, Legends, Lakewood Village, Northeast Hills, Northview Condos, Russian River, Stonecreek, Stone Fort, Sunridge, Taliesin, University Club, University Courtyards, Whisper Oaks, Windhill, Woodforest, Woodland Trails, and the Woods at SFA. Household Units and Size: The U.S. Census reported 27,064 housing units in 2009.The average household size was 2.5 persons, compared to 2.8 persons for Texas. Homeownership rates were 60.1% compared to statewide 64.7%. In Nacogdoches County, 23.9% of households included persons less than 18 years of age in 2010. In Texas this was 27.8% percent. The percentage of households with persons 65 years of age or older was 11.7 in Nacogdoches compared to the statewide percentage of 10.2. Owner and Renter Occupied: According to the 2010 census, the percent of owner-occupied units with a value of $100,000 or greater in Nacogdoches County was 21.5%, compared to 24.3% for the state. Home care Senior center Visiting nurses A continuum of care is available in Nacogdoches for senior residents. Elder-care facilities, home care, meals on wheels, a Senior Center, public transportation and many home health companies are ready to assist.